Taking a step up from the normal world of taking photos, viewing and storing them on your computer and printing them out, professional photography demands a more 'workflow' oriented ethic. Large numbers of shots need to be downloaded, edited, indexed, catalogued, converted and more besides. 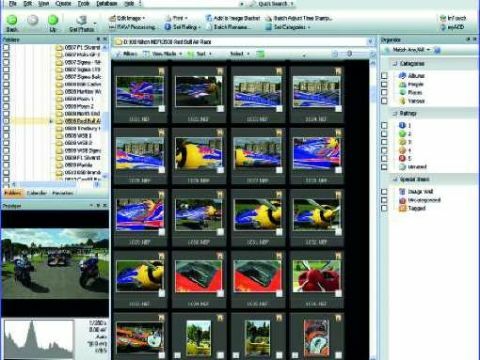 All too often, this requires a raft of software programs and a series of time-consuming tasks which can bog the photographer down in routine tasks. ACDSee Pro is a single, all-encompassing program that aims to dramatically simplify, integrate and speed up the whole process. At the heart of the program are fast capture and preview tools which offer direct compatibility with a wide range of camera RAW formats. Once the images are imported, it's easy to organise photo collections with a powerful indexing and tagging system for subsequent rapid searching, and you can easily create HTML photo albums. ACDSee Pro really gets into its stride when you come to edit RAW files, with intuitive tools for adjusting exposure, colour balance, sharpening, noise reduction and so on. However, the real strength of ACDSee Pro is batch processing, with facilities for applying a barrage of image 'corrections' to large numbers of RAW photo files automatically, exporting them as JPEGs in the process.